What I’d like to discuss in this particular post is why newsletters don’t work any more. Now, you’ve probably seen many websites where they’ve got a little box somewhere which has a box for your name, and your email address, and it says, “Sign up to our newsletter.” To be honest, it’s a waste of real estate on any website simply because people these days have inboxes full of things trying to grab their attention. Nobody in their right mind is going to sign up to a newsletter unless they have a really good reason to do so. Now, I’m not saying that your newsletter is no good, uninteresting, unhelpful, or that it isn’t engaging. What I am saying is that you’re having to compete with hundreds of other things hitting at their inboxes on a daily basis and they’d have to have a very good reason to want to sign up to your newsletter in the first place, and they’d have to have a very good reason then to read it when it hits their inbox. And, unless you’re giving them those two good reasons, that little sign-up box on your website to sign up to a newsletter is, like I said, a waste of space. Simply because nobody signs up to newsletters these days, or next to nobody, largely because there’s just too much hitting our inbox. If you’re like me, you’ll have loads and loads of stuff in your inbox, some of which you’ve subscribed to, much of which you didn’t, and you have to try sorting out the stuff that’s useful from the stuff that isn’t and then tackle your boss, and your clients, and all the stuff that’s happening with your work. To be honest, a newsletter, unless I have a very good reason for reading it, will just sit there. Some people will file them in an archive folder in the hope that they’ll be able to come back to it and say, “Well, I might get around to reading it.” But let’s be honest; very rarely does that happen. We’re just too busy these days. So, if a newsletter doesn’t work and having a newsletter sign up on your website is a waste of space then what can you do? Something we’re working on right now in our website design business is a Seven Essential Tools video training course. We’re giving it away for free on our website. You could, if you’re a physiotherapist for example, we’ve got Five Simple Ways to Improve Your Posture to Improve Your Health. Or, if you’re an accountant, Ten Simple Mistakes that People Make and Waste Money on Tax. It’s highly likely, no matter what business you’re in, that you could think of something which is going to pique their interest. The point is, no one’s going to sign up to any kind of newsletter on any kind of website without a very good reason for doing it. If you’re honest with yourself, you can ask yourself: “When did I last sign up to anything unless the reason for doing it was very, very compelling? 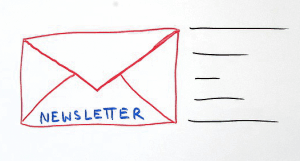 There was something in it for me.” And, unfortunately these days, a newsletter just isn’t going to cut it. It’s not enough. Now, another point on getting people to sign up for things, the less information you ask for, the higher your response rates are going to be. I’ve seen sign up forms for all kinds of free stuff that people are giving away to capture data, and they’ll ask for name, email address, phone number, company name, what your turnover is, and all of this stuff. Unfortunately, every time you ask for something else from their information, anytime you ask for a new bit of information, you’re cutting your chances of getting a response, sometimes by as much as 20% for every little extra item. So, ask for the bare minimum, just their first name and their email address. Because, to some extent, if your website is giving something away, say if you’re an accountant and you’re giving away tax tips, there’s only going to be two kinds of people who are interested in your tax tips and that’s going to be your competition and people who are actually interested in saving money on tax. If you’ve got their contact details and you know they’re interested in saving money on tax, then you can start to market to them as to how good you are at helping people save money on their tax. It’s logical. So, then, it makes it a heck of a lot of easier for you to market to these people. They’re willingly giving you their information. You know they’re vaguely interested in something to do with services that you provide. So, you’ve got an opportunity to promote to them along their lines of interest. I have one client who helps people improve their wellbeing by improving their breathing. 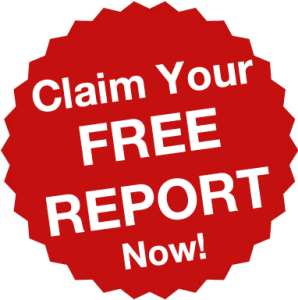 There’s only two types of people who are going to sign up for his free reports, and that’s going to be his competition and those who are interested in improving their wellbeing. The great thing about it is, if people are interested in improving their wellbeing, then they’re likely to be interested in hearing more stuff in his “not a newsletter,” and also possibly interested in hearing about how he can help them, and they pay him for doing it. So, I hope you get the point of this. Just remember why newsletters don’t work any more. You’ve got to give people a very good reason to sign up to your non-newsletter or whatever it is and, usually, that’s in some kind of free gift. You don’t have to spend a lot of money on it. It could just be a free report. It could be top tips as we’re doing with our web design business. We’re going to be giving away a free seven-part video series. All of that is designed at helping people, but it’s that incentive to take that first step because no-one these days signs up for newsletters without a very good reason. I hope that’s been useful. If you have any thoughts, please put them in the comments below. Or if you’d like some help with putting together something on your website that gathers data like this then give us a call 0116 3552194.